Bottles of dark amber syrup at Bascom Maple Farms in Acworth, N.H.
One of the things visitors say they like most about watching the sugaring season at Bascom Maple Farms in Acworth, N.H., is when the evaporator runs in the basement of their sugarhouse and the powerful fans blast a column of steam 4 feet wide through the chimney stack and scent the air with maple. Though that hadn’t been happening much this year. 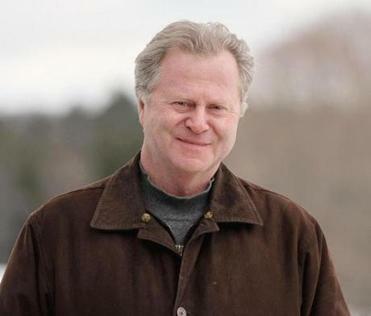 When I asked Bruce Bascom, who owns Bascom Maple Farms, to characterize the 2014 sugar season he said, “What season?” Meaning that the sap flow hadn’t gotten fully underway yet and judging by the forecast, might not get underway here until the end of March, or later. 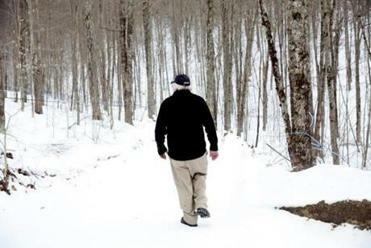 The long, cold winter oddly recalls the record warmth of 2012 as both may be caused by climate change, which threatens the region’s iconic sugaring industry. This year sugarmakers all over the region are frustrated, and so were the people who wanted to visit the sugarhouses and buy the new syrup. The sap flow in maple trees begins during that delicate time of year called the freeze-thaw period, when temperatures dip below freezing at night and rise above freezing by day. Temperatures from the mid-20s to the mid-40s are ideal. When that happens, the thermodynamic energy of the sun causes water to move from the ground through the tree’s roots and the outer cambium layer to its branch tips. In maple trees, that water becomes sap that contains sugar converted from carbohydrates produced in the leaves the previous summer. The concentration of sugar is about 2 percent, and maple sap tastes like a sweet water. Some sugarmakers like to drink it, and there are those who are considering bottling and selling it. Douglas Whynott, fascinated with traditional New England industries, chronicles a sugaring season at Bascom’s Maple Farm in N.H. Some people study the movement of sap — or sap hydraulics as it’s called — but there is a great deal of mystery. The maple tree contains air in its cells, and when ice crystals form at night that air pressurizes and aids in the sap flow. The maple tree is very sensitive and responds quickly to warm days. As the sun advances north in the spring, the delicate freeze-thaw period mirrors that push northward, like a band of heat. 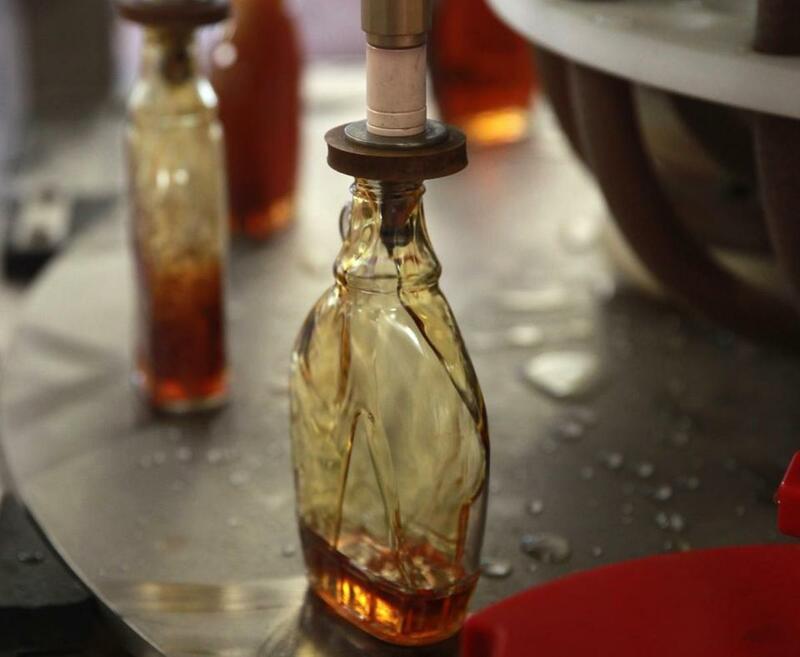 Sugarmakers in New Jersey begin their season in late January, while those in Quebec often make their syrup in April. At Bascom the sugar season is usually well underway by the second week of March. In 2013, a banner year with a sap flow that began in late February and lasted until mid-April, the farm produced just under 28,000 gallons of maple syrup. By March 10 last year, they made 6,000 gallons. Two years ago in the 2012 sugar season, one of the strangest and warmest maple syrup seasons in history, temperatures in March hit the 70s and the sap run was coming to an end. The sap flow hadn’t gotten fully underway yet and judging by the forecast, might not get underway here until the end of March, or later. That early 2012 heat brought media reports of the possible effects of climate change on the maple syrup industry. There were predictions that by the end of the century, should emissions rates continue to increase, winters would be drastically reduced — to as little as two weeks in Connecticut — and commercial maple syrup production would only be possible in the northernmost regions of the United States. Research suggests that over the past half-century the maple production season has been shortened by about 10 percent due to climate change, and growers generally agree that freeze-thaw cycles have become much more unpredictable. As for the winter of 2014, the frigid temperatures reportedly could also be driven by a changing climate. According to some reports, warm air moving in the stratosphere sinks into the Arctic, destabilizes masses of cold air, and pushes them to the south. At Bascom, located on a perch of farmland on the southern slope of Mount Kingsbury in Acworth, there are 50-mile views across Vermont and into Massachusetts. It’s the kind of place that inspires feelings of possibility. Trucks are coming and going on this day. Some are parked by the equipment store, and customers inside carrying shopping baskets are picking up spouts, jars, labels, tubing tools, or books. A semi-truck has backed into the bay at the Cooler, a refrigerated warehouse where 55-gallon drums of maple syrup are stored. There always seems to be a semi-rig at Bascom, loaded with drums of syrup from those places where Bruce Bascom buys syrup on the bulk market. Bruce is the majority buyer of bulk syrup from upstate New York, and he also buys from Ohio, Wisconsin, Pennsylvania, Vermont, and Quebec. In 2012, Bruce bought more than 40 trailer loads of maple syrup from farmers and producers in Quebec. The 2014 sugaring season started slowly for Kevin Bascom. Kevin Bascom is down in the basement below the store, processing syrup and sending that blast of sweet steam into the air. There is no smell quite like maple, and no taste either. One sugarmaker told me that they aren’t selling a sweetener — they’re selling a flavor. It’s an iconic flavor, its origins in North America, and the flavor that artificial syrup manufacturers have built into an $18 billion industry. Kevin is a slight man and soft-spoken, but he is a master mechanic and his powerful machines are running. It’s almost impossible to hear him amid the kaleidoscopic sound of the evaporator steaming, the fans that sound like engines, and the reverse-osmosis machines that hum like a water-processing plant. I have to almost shout when I ask Kevin what he thinks of the 2014 sugar season. Today’s mid-March boil is actually Kevin’s second of 2014. When temperatures got into the 40s on Feb. 22 and 23, he gathered about 75,000 gallons of sap and made 1,733 gallons of syrup. That may seem like a lot of syrup and would make a fantastic season for most sugarmakers, but for a farm the size of Bascom the numbers are disappointing. At their peak, they can make a gallon of syrup every 22 seconds. What makes this possible are technical innovations introduced in the 1960s and 1970s, improvements which also have helped offset the shorter seasons. Bruce Bascom’s father, Ken, hung 7,000 buckets and made about 1,500 gallons a year. 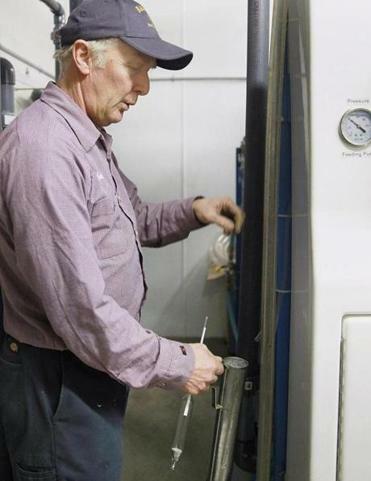 When Bruce returned to the farm after college he changed to plastic tubing, and within a few years had 25,000 taps and the farm was soon one the largest producers of maple syrup in the United States. In 2014, Bascom has 80,000 taps feeding into their evaporator. Another innovation was reverse-osmosis technology, which utilizes filters to separate water from sap. Without reverse osmosis, a sugarmaker boils 40 to 50 gallons of liquid to get a gallon of syrup. The Bascoms concentrate the sugar to 20 percent, and boil only four gallons of fluid. Energy savings are significant. On this day Kevin hustled about, checking on the boiling at the evaporator, then on the flow from the evaporator to the filter presses and to where worker Ed Blodgett poured hot syrup from a hose into 55-gallon drums. He occasionally went into the room with the reverse-osmosis machines, to check on his sap supply. With the 13,000 gallons of sap, Kevin made 340 gallons of syrup on this day, for atotal of over 2,000 gallons for the year. That’s a lot of maple syrup, but less than 10 percent of their normal yearly crop. By the end of the following week after boils on partial sap runs, Bascom’s had reached 5,300 gallons. “We should have 20,000 gallons by now,” Bruce said. In Bruce and Kevin’s minds, the sap run hadn’t truly begun even during this last week of March. “Hope runs eternal,” said Bruce. It’s all about the weather, that delicate time of year that causes the trees to stir and the sap to flow. Douglas Whynott is the author, most recently, of “The Sugar Season: A Year in the Life of Maple Syrup, and One Family’s Quest for the Sweetest Harvest.’’ He teaches writing at Emerson College and in 2013 was a Fulbright scholar in the US Studies Center at the National University in Bogota.